Utilizing new primary source material from the Papers of George Washington, a documentary editing project dedicated to the transcription and publication of original documents. A Companion to George Washington features a collection of original readings from scholars and popular historians that shed new light on all aspects of the life of George Washington. 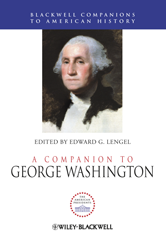 Provides readers with new insights into previously neglected aspects of Washington's life. Features original essays from top scholars and popular historians. Based on new research from thousands of previously unpublished letters to and from Washington.